I had been to Mangalore during Dasara. This time I choose to drive the not so good but fastest route via shiradi ghat, it took me home for lunch with a nice drive of 6.5 hours. On October 7th, as the clock ticked 6:30 in the morning, we left home. 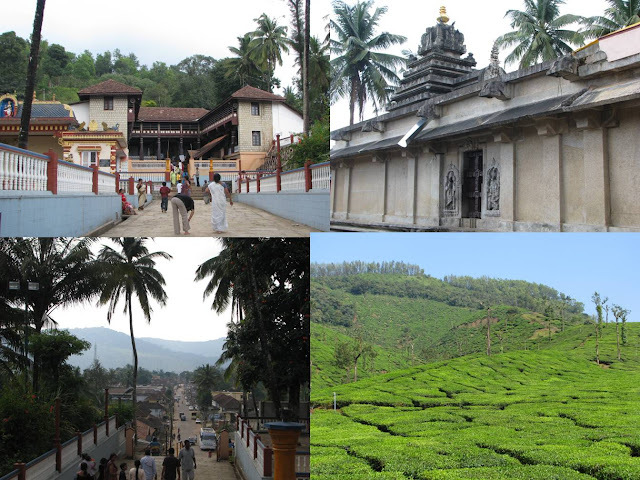 We drove the Mulki-Padubidri-Nitte-Karkala-Kerekatte road. Thanks to an early breakfast at home, our next stop was near the forest check post at around 8:30AM for some tea and nice spicy biscuits. 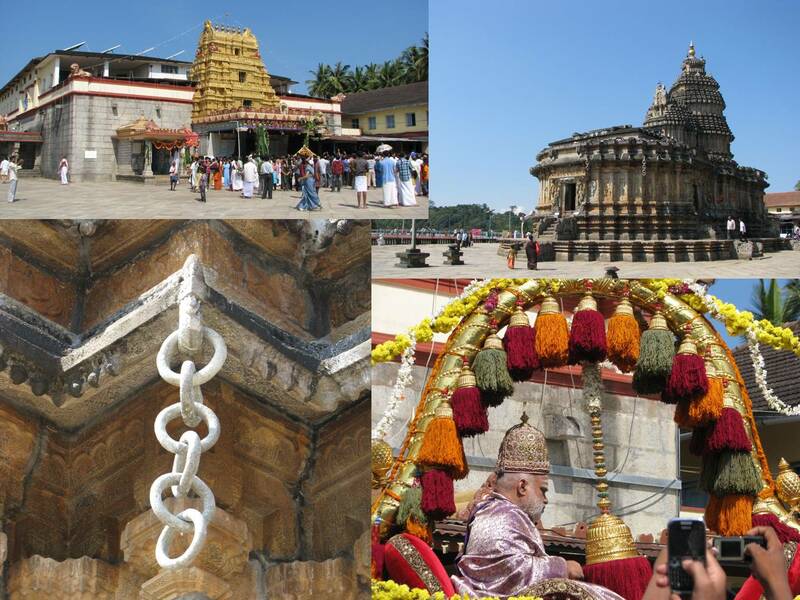 We reached Sringeri by around 9:30 AM. At Sringeri, the temple was a little crowded due to holidays. We also got to see the palaki meravnige of swamy. The stone carved chain at one corner of the temple entrance is a major attraction as it is completely carved and not assembled. Another attraction here is thousands of fishes that come very close to proximity of humans to fetch their free food offered by devotees. From here we drove to Horanadu. On the way my good friends; the Muslim neighbors have some land and a shop. Musta, Jamila and her husband were there and we decided to stop by to say hello. I was hoping to fill my car trunk with some coffee stem for some craft work but unfortunately as I had not informed earlier they could not arrange the workers to get a stem cut and dried. Long ago, sometime during college I had brought one such coffee stem from there and polished it before painting. As kindest of people they are who are always so generous to guests, they offered us a bottle of local honey obtained from a friend. We next drove to Horanadu. After a quick darshana, we had good lunch at the temple. One of the common things you may notice in South Canara and Malnad regions is that temples offer free lunch throughout the year to its devotees. After lunch we drove to Kalasa, another nice old Kalaseshwara temple awaited there on a small hill overlooking the small town. We also visited a small tea shop near a tea estate on the way back. The drive back was via Kudremukh; once a thriving township with an iron ore plant and a dam but now close to being a ghost town midst those beautiful evergreen forest and Western Ghats. The scenery was amazing. A light drizzle made the drive even more pleasant. On the way back we stopped at Bajagoli for some good Mangalore style snacks like – Biscuit roti, goli bajje and buns. We took the Moodabidri route and stopped at the 1000 pillar basadi for a short visit before driving back via Moodabidri-Kateel-Kinigoli- Halenagadi route. Galibore was the destination chosen for our team outing; a team that has suddenly grown from 29 to 45 or more. After a good buffet breakfast at Vaibavi residency, off Kanakpura road, we reached Galibore at around 9:30AM on the 30th of September; after some lime juice tagged as welcome drink, we assembled at a place to divide ourselves into three groups. 18 of us set on a hiking up a small hill; it was fun but the hot sun burnt away all the energy. We returned back to the camp to go on a terrible, unenjoyable coracle ride that almost baked us. After lunch we relaxed on a big net tied to several big trees surrounding it. But the best part was rappelling on a twenty feet tall rock. By the time some of us finished rappelling, it began to rain and we had to call it a day. The rocks that we had climbed turned slippery and we had to get down using a rope which was an adventure by itself. Many slipped; many struggled and finally got down to board the jeep. Here my friend Jon found he had lost his wedding ring. We searched the gloves used during rappelling but no luck; so four of us set to search the area. Diappointed, we returned back. On the way back our TT tires skidded on the sludge and all of us got down to push the vehicles. With the effort being distributed among a big team, the vehicles made its way out of the sludge one after another. A rappelling, coracle ride or trekking only divided us into three groups and separated us with individual activities and life’s experience provided us a good team building activity that the entire day at Galibore could not. :-) It was fun to watch few engineers do Root cause analysis and evaluation of situation before the rest stood ready to push the vehicle that seems always like the only and easiest way out of a sludge. As we cherished the good times by looking at the pictures taken during the outing, many of our colleagues turned detectives by checking photos of Jon and almost spotted a ring like figure in a picture. When someone points out a probability and many confirm the same, it deserves a search and cannot be ignored to let the thought of possibility creep in forever; so on Tuesday (4th) a search team of four again set on a mission to find the ring. Two workers joined us to search and they were as eager as us. It was almost impossible to search in the rocky hill that has seen heavy rainfall during the previous two days but after having done another round of search, we were relieved that we had given our best efforts to find it. Jon was disappointed that he lost his dear ring but he was also happy that he made his best effort to look for it.